You know that by neglecting to market your website where you showcase your products and services using social media, you will be missing out on the powerful results that an effective social media optimization marketing strategy affords. Besides, your competitors and clients are on social media. However, how do you increase website traffic using social media? You CAN take people to your site by maximizing the potential of social media whether you are a manufacturer, a plumber, a dental office, or a software company. And no, I am not dreaming it up. You can go and check my social media optimization case study for a software client of ours that serves B2B (business to business) and B2C (business to customers) users. Since this is a two-part article, the first part is on preparing your website before the visitors arrive. In short, this first part is about your site and your business goals. This is, IMHO, more important than the second point. For the second part, I am going to share tips on how my team & I use social media to drive traffic for a B2B and B2C startup company. Someone convinced you to create a website to make your business legit. You may have arbitrarily thought that by having a website, the people will be stampeding to come and visit it. BUT they did not, did they? Also, you may have thought that forking out hundreds of dollars to make it look pretty snazzy; people would come and visit. Nope, they have not. As of this writing, that is how many websites we have now. 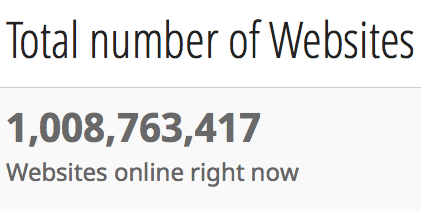 Your business website is just one of the millions of websites according to this live stats. People will not seek you out. YOU have to make THEM find your website. How? There are other ways of hustling that you can do, but we do it by using social media. Note, however, you see social media is a selling tool that we can use without selling. As I write this article, I am thinking about our visitors that are coming from Europe. They will be here in a couple of months; already, we are prepping up our home for their arrival. Since it is a family that is more than the usual number of guests we host, we are keeping a checklist of things we need to do NOW. Our list includes making sure we have enough bedding for everyone, deep-cleaning the floor, sprucing up the backyard and tons of to-dos on our list. In fact, we are preparing our ENTIRE home for our guests. This is point one of this 2-point steps. It is about preparing your “house” for your guests. We call it your website. You have to get it ready to maximize the visits of those who are going to visit it. 1. What is your reason for driving traffic to your site? Driving traffic just for the sake of driving traffic is pointless. Now, why would you invite your audience to your website from the social media platform? Will it be worth THEIR time? What is worth their time are contents that are useful and relevant to them. You have to meld that with what is relevant and key for your business as well. Are website visits your social media key performance indicator? A key performance indicator (KPI) is anything that you measure that has a direct correlation to your marketing goal. In other words, it cannot just be anything. Connect it to what you are trying to achieve. Note that a particular KPI may have a different content format and call to action. It may have different tactics and strategy too. We recommend that if you are a small business, just focus on one to be able to track and manage it effectively. If you are a DIYer and like to manage social media yourself, consider your time in learning and implementing it. Time is $$$s, right? If it’s too much for you, scale it by hiring an experienced social media pro. 2. What do you want them to SEE, KNOW, and DO? Your call to action should not end in your social media post. Social media is not the end; it is the means to an end. That end is your website or preferred landing page. Therefore, your website page or preferred landing page should also have a call to action. Your website sub-pages should also have a call to action. If you want people to sign up for news or updates, then you MUST have a sign-up form. If you want people to download some freebies, then you MUST have something for them to download. Do you want people to contact you? Then make sure your contact information should be prominent or easy to find. 3. Plan with intent to measure and to identify opportunities to make smart decisions. This goes back to my point above: “driving traffic for the sake of driving traffic is pointless” if you do not measure what you are doing. Worse, you have the data that your social media data analyst gave you, but you do not use it at all. Use social media data to refine your programs by making changes to meet your goals. Repeat those that work, and prune what does not. Data can tell you topics that your audience like, who it is attracting, and the types of posts you should create more often. Data can, for a fact, tell you which social media platform is driving traffic to your site. With that info, would you spend more time there vs. other social media platforms? Data can tell you many things but don’t get trapped by it. Focus on the data that has a direct correlation to your goal. 4. Take stock of all your contents. By all, I mean ALL. Create a content hub that houses or lists all of your contents. Your contents could be any of the following. At Social Success Marketing, we use Excel and OneNote for the list. For the image, my team uses Google Photos and DropBox. Use what works best for you. 5. Create QUALITY social media copies (posts) using your contents from a blog, as an example. ~ Is your social media copy really what the link is about? Oh, how I hate bait and switch, don’t you? ~ Did you include a high-quality and in-context image? ~ Is it easy to read and understand? ~ Did you spell-check and grammar-check it? I use Grammarly for this. I have to. English is not my second language; it is my fourth language, so you bet I have to do grammar-check multiple times! It’s not perfect still regardless of the number of revisions, but it’s still worthwhile to invest in a tool like that. What do you YOU do to increase traffic to your site? Part 2 on how to grow social traffic is now out.